Rose Black: Demon Seed is Rough Cut Comics' newly released follow-up to their 2004 graphic novel Rose Black which told the story of a vampiric angel sent to earth some 600 years ago to battle evil on its own terms and which she accomplished during the Cold War as an agent of the British Secret Service. There is a contagion sweeping the Middle East that makes people highly aggressive and an MI6 team is dispatched to a Libyan compound believed to be at the centre of the outbreak. Eloise Parrish is a new MI6 agent who joins the special ops team that includes Rose Black but, in the Libyan desert, reveals her truly evil nature to Rose and her partner Dobie. Leaving Rose and Dobie for dead, Eloise returns to Britain with the survivors of the raid as the contagion spreads while Rose and Dobie travel to Scotland to try and discover who this woman with Rose's power, but not her conscience, really is. The original Rose Black graphic novel had black and white artwork by penciller Jaeson Finn and inker Colin Barr and, between that and a Durham Red-style character, it had a rather nice old-style 2000AD feel to it. With Jaeson Finn having moved on in his career to film work, this second outing for the character is in full colour with artwork by Joel Carpenter and colours by Derek Dow. With the move to a more modern style of digitally coloured artwork the feel of the book moves away from 20th century 2000AD and heads towards 21st century Panini UK territory, albeit rather more violent than any title Panini would release to the UK market. 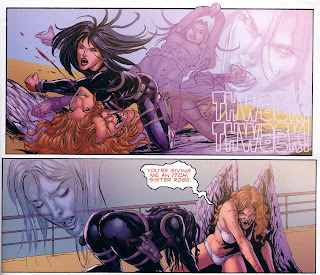 The comparison continues with Panini UK best known for US superhero reprint titles and this book is dominated by its two 'super-powered' vampire/angels as they suss each other out before having several almighty superhero type fights. 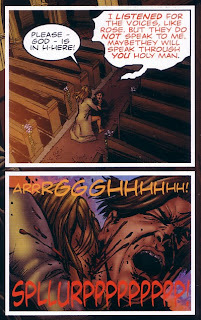 Indeed Carpenter's dynamic artwork portrays Eloise as a superhero-style statuesque blond who battles her way through her outer clothing as the book continues leaving her only in her underwear for the final battle. Rose, consistent to her character, remains rather more demure albeit it in a tight fitting outfit that proves to be rather more resistant to combat. The ending of the first book which revealed Rose as an avenging angel rather than a vampire left writers Ed Murphy and Tom Campbell at a point where they could have taken the story of Rose in many directions. In Demon Seed the religious overtones that made the first book so interesting, but also less commercial, are virtually swept away and replaced with fast moving action and a plot that, in part, echos the Arab Spring uprisings despite having presumably been written before them. Coupled with the new art style, this makes the book feel much more modern than the previous outing for the character. 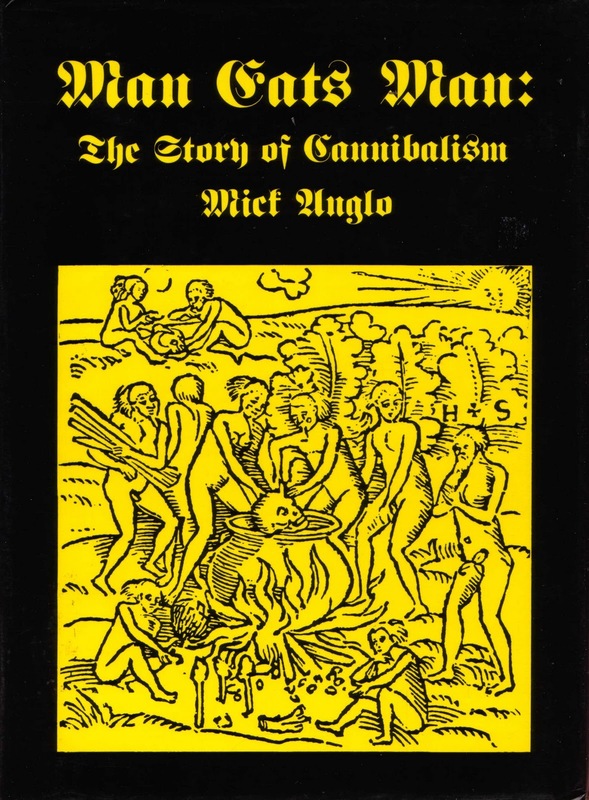 The book is split into four chapters with four cover illustrations at the back so Rough Cut would have had the ability to release it as four comics as opposed to one graphic novel. Of those pin-ups one is the superb image by Carpenter that is used as the book's cover, while another is a similar but more touching image of Eloise cradling an unconscious Rose by original artist Jaeson Finn which makes for a nice link between the two books. 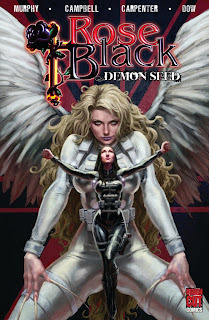 Rose Black: Demon Seed is a tale of the Rose character with a much more modern feel to it than the original and, while I miss the old style of art and plot, this is much more commercial approach that should pay dividends for Rough Cut Comics amongst the superhero reading fraternity. There are more details about Rose Black: Demon Seed and other Rough Cut Comics titles on the Rough Cut Comics website and blog while more illustrations from the book can be found on their Facebook page. The downthetubes review of the original Rose Black graphic novel can be found here. Rough Cut Comics will be appearing at Thought Bubble this weekend, 19/20 November 2011, and their table is located in Savilles Hall. Manchester's Lass O'Gowrie pub - already famed for its comics and Doctor Who-related events - is staging Alan Moore and Ian Gibson's The Ballad of Halo Jones as a fringe play in January next year. "It's an adaptation of the first two books using the ground floor or the pub as the set," landlord Gareth Kavangah tells us. "Rebellion have approved it and Alan Moore has given it his blessing too, which is lovely. "We cast a week today and costumes will be provided by the students from Manchester Metropolitan University." The play is being staged as part of the pub's inaugural Midwinter Lassfest fringe festival. Other treats to be staged include an adaptation of Russell T Davies' Midnight, beer tasting with Neil Morrissey and live episodes of Coronation Street from 1968, staged in the pub as part of a Jack Rosenthal season. 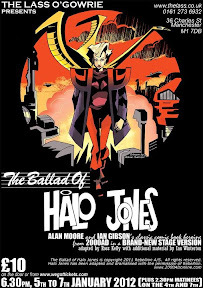 First published in 2000AD, The Ballad of Halo Jones has been brought to the stage before. In fact, the first stage play was directed by my partner back in the 1980s, Clare Walters and I did all the PR materials for it based on imagery from the original comic. This first adaptation - more info on this web site - was first performed by In The Red Theatre Company at the Edinburgh Festival in 1987, and then taken on a UK tour. The second issue of the amazing Doctor Who fan magazine Vworp Vworp - a fanzine about the long-running and best-seling Doctor Who Magazine - is on sale now. Quite simply, if you are a fan of Doctor Who and Doctor Who Magazine, you should get out there an buy this, because it's brilliant - and not just because of the freebies that come with it. Apart from anything else, it includes an all-new comic strip featuring the Dalek killing anti-hro Abslom Daak, created by Steve Moore and Steve Dillon. More to the point, it's written by Steve Moore and drawn by longtime DWM comic artst Martin Geraghty and worth the cover price alone. The first half of an exhaustive Abslom Daak tribute, including interviews with writer Steve Moore, and artists Steve Dillon and David Lloyd. A series of DWM editor interviews kicks off with a fascinating chat between founding Dez Skinn and current head honcho Tom Spilsbury. The magazine also chats to Paul Neary, Alan McKenzie, Cefn Ridout and the elusive Sheila Cranna. Ex-Doctors Tom Baker and Colin Baker talk about their comic strip selves. Dave Gibbons, Steve Parkhouse and Mick McMahon discuss The Tides of Time and Junkyard Demon, and we take in The Lodger with Gareth Roberts and Mike Collins. Plus there's more comic strip - The Housekeeper, a story written by Paul Magrs and drawn by Bret M Herholz starring Mrs Wibbesey and the Fourth Doctor. 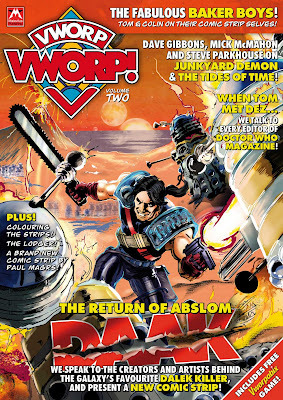 Vworp Vworp 2 comes with two covers: a wraparound Abslom Daak cover by Mike Collins, and an early Doctor Who Monthly pastiche featuring Junkyard Demon (with Jason Fletcher and Ben Willsher’s take on Daak on the back. Plus, there's a fantastic free gift in the form of a ‘Vworpabix’ board game. Based on the 1970s Weetabix game, Vworp Vworp's has 16 character cards by Adrian Salmon and boards by Paul Grist, Jon Pinto, Leighton Noyes and Graeme Neil Reid. A very limited edition magazine, you can order it here from the Vworp Vworp web site. It's totally brilliant - so get out there an grab one while you can. 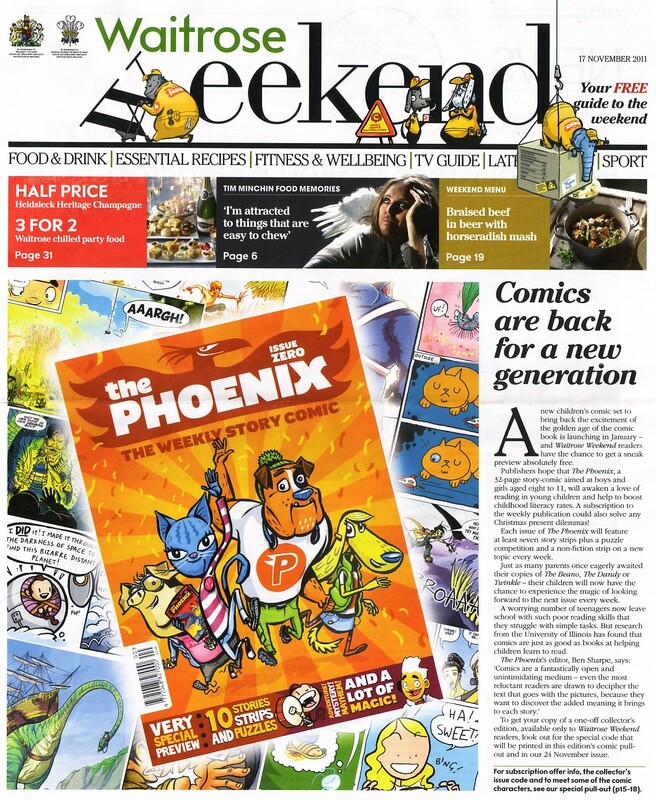 The first issue of the new Phoenix comic is due to come out on at the start of January 2012 however Waitrose supermarket customers are being given the change to get a sneak preview with a printed copy of the Phoenix Issue Zero. 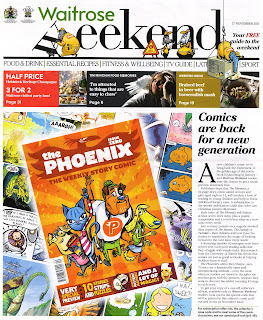 The current issue of Waitrose's free weekly Waitrose Weekend publication has The Phoenix featured on its front cover and a four page centrespread pull-out all about the new comic. In addition there is a printed code in the pull-out that, when put into the appropriate page of The Phoenix website, allows readers to get a free copy of the preview issue zero. Emphasising the University of Illinois' findings that comics are as good as books at helping children to read, the Waitrose Weekend describes Phoenix as "published weekly at £2.99, the 32-page comic has at least seven story strips in every issue, plus a puzzle competition and a non-fiction strip on a new topic each week." Phoenix editor Ben Sharpe is quoted as saying, "We're making The Phoenix for all 8- to 11-year-olds; boys and girls. But really it's for everyone. Children will have their favourite strips, but so will kids in their 30s, 40s, 50s and beyond!" The pull-out also introduces readers to the Phoenix characters of Monkey from Jamie Smart's Bunny and Monkey, Sophie Delcourt from Daniel Hartwell & Neill Cameron's Pirates Of Pangea, Castanet from the Etherington brothers Long Gone Don and Kate Brown's amnesiac child in The Lost Boy. It also gives details of various subscription options for The Phoenix ranging from a full year down to a five issue taster. These are also available on the subscriptions page of the The Phoenix website. There are more details about The Phoenix on the comic's website. The Phoenix Issue Zero is available by entering the Waitrose code and your details into the Waitrose page. You know Christmas is on the way when we start getting PR for perhaps the stranger kinds of comics tie-in merchandise at downthetubes. Case in point? New guitars from Nevada Music featuring favourite Marvel Super Heroes including Wolverine, X-Men, Spiderman, Iron Man, Captain America, Thor and the Incredible Hulk. The guitars come with colourful Marvel super hero graphics and detailed artwork that adorn each guitar, strap and pick, set against a black background. Acoustic Guitars come in half sizes suitable for younger players whilst the electric versions are available in ¾ and full size guitars. Nevada are proud of their product and tell us both music and Comic fans will find a lot of fun and inspiration in these new instruments from Peavey featuring their favourite Marvel Heroes. Acoustics are priced from £49.99 and Electric Guitars from £99. Earlier this week Comic Bits Online broke the news of the passing of Mick Anglo, the British comics writer, artist, editor, and publisher, most famous for his association with the creation of the comic character Marvelman. Anglo died, aged 95 on 31st October 2011. Pádraig Ó Méalóid produced this extensive obituary for the Forbidden International Blog - and has kindly given us permission to cross post it here. Mick Anglo was born Maurice Anglowitz in the Bow area of the borough of Tower Hamlets in London’s East End to Hyman and Rachel (nee Pelter) Anglowitz. He claims he was born on the 14th June, 1916, even though his birth certificate gives the date as the 19th June, due to his father registering the birth late – it wasn’t actually registered until the 28th July, well over a month later. He was the youngest of a family of five boys, the others being Andrew, Sidney, Stanley and Richard. After school in the Central Foundation Grammar School in Cowper Street in London’s Islington Mick got a scholarship to the Sir John Cass Art School in Aldgate. He left school at eighteen and eventually got some freelance work drawing clothing designs for one of the London fashion houses. In 1939, at the age of twenty-three, he enlisted in the British Army at Oxford, becoming an infantryman in the Royal Welsh Fusiliers, and at one point found himself working as a cartographer at Earl Mountbatten’s headquarters in Sri Lanka. He also did some cartooning work for SEAC, the official army newspaper for the South East Asia Command, and later on for the Singapore Free Press, which was revived at the end of the war. On 29th December 1940 he married Minnie Cedar in the Wembley District Synagogue in Hendon, London. On their marriage certificate, both their fathers are said to be tailors, and it turns out they lived on the same street. Mick’s occupation is given as Fusilier #6468556, with his civilian occupation as commercial artist noted in brackets, while Minnie was a tailoress. When he got married his surname was recorded as Anglo, as was his father’s, who was by now styling himself Harry Anglo, rather than Hyman Anglowitz, so Mick Anglo was already halfway to the final version of his own name. "As I recall, it was a still drab post-war Britain, and I’d been doing this, that, and the other to keep body and soul together. One day in the early 1950s, my next-door neighbour showed me a couple of bright American-style comics bearing the distinctive triangular logo L Miller and Son, an English company, with a 6d price on them, and he suggested I check them out for some further artistic work. 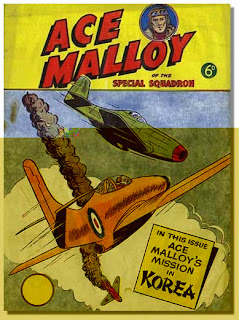 I duly visited their warehouse headquarters in Hackney Road, London, and was fortunate to meet the son, one Arnold Miller, who, it turned out, had formed his own branch of the company to publish original British space comics, as the bulk of the lines up until then were American reprints, such as Captain Video. Anyway, he was raring to do a series under his own banner ABC (Arnold Book Company), and I was very interested, as you can imagine. I showed him some of my work I’d brought along, though what it was escapes me, and he was suitably impressed. It was then, during discussions, to my surprise I discovered that the boss, Arnold’s father Len, was in fact the same man who once sold me comics as a kid! … After some in-depth discussions re could I create such-and-such and find other artists, etc, things started to buzz, and very soon I formed Mick Anglo Limited, and found myself searching for suitable premises for a studio. Eventually I located some rooms at the top of a rickety flight of stairs in an old building at 164 Gower Street, London NW1, long since demolished, which became the Gower Street Studios." 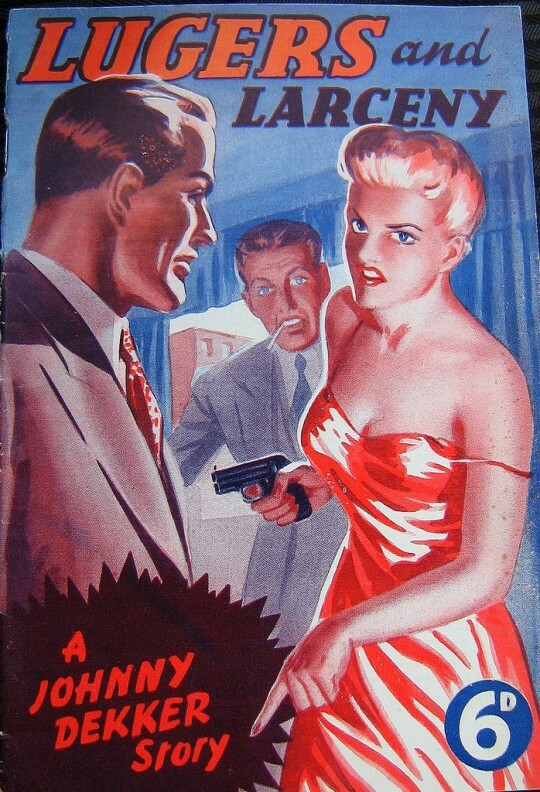 Mick Anglo’s first work for L Miller and Son was Ace Malloy of the Special Squadron #50 in August 1952, published under the Arnold Book Company imprint, at which point Anglo was apparently already in his studio at Gower Street. Further work for the Millers followed, both for Arnold Book Company and for L Miller and Son Ltd itself, including titles like Space Comics (1953), starring Captain Vic Valiant of the Interplanetary Police Patrol, and, later on, Space Commander Kerry and Space Commando, both in 1954. “One day in late 1953, I think, the Millers rang me to say, ‘Come over, Mick – urgent – very urgent!’ I went to the warehouse premises, and much consternation! Mick Anglo says that he went back to Gower Street and thought about it, and decided that what they needed to do was create a British copy of Captain Marvel to step into his shoes, and to carry on instead of him. The character Anglo apparently suggested to take Captain Marvel’s place was virtually a carbon copy of him. The name Billy Batson was turned into Mickey Moran, with Moran being a young copy boy for the Daily Bugle newspaper, as opposed to Batson’s position as a reporter for Radio Whiz; the costume was changed from red to blue, and the cloak was done away with, for being too much trouble to have to draw all the time; the dark hair became blonde; the magic word SHAZAM!, given to Batson by the wizard Shazam, was replaced by the word KIMOTA! 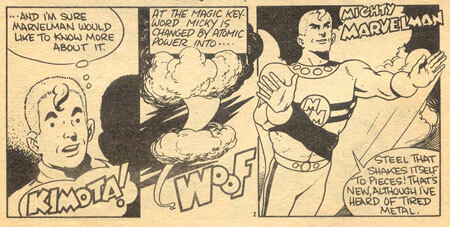 – a slightly altered backward spelling of the word Atomic – given to Moran by Astro-physicist Guntag Barghelt, making Marvelman’s powers science-based, like Superman’s, rather than magic-based, like Captain Marvel’s; and the transformation was all but complete. All that was needed was a name. 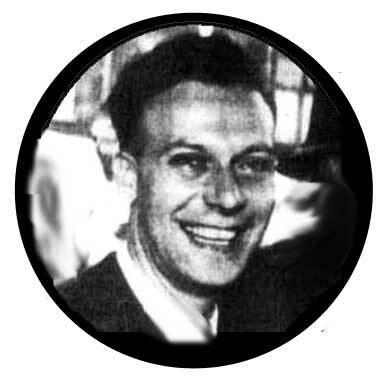 Six months after the launch of Marvelman, Mick Anglo formed Mick Anglo Limited, UK company number 537200, which was registered on the 21st of August 1954 – with Anglo having filled out the forms in his solicitor’s office nine days earlier, on the 12th of August – with a nominal opening capital of one hundred pounds split into one hundred shares of £1 each, with ten of those shares being drawn down and allocated, nine to Mick Anglo, and the other one to his wife, Minnie. 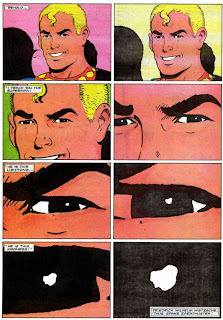 The exact circumstances surrounding the creation of L Miller’s Marvelman, however, are still the matter of some conjecture, as is Mick Anglo’s part in it. He certainly did have a part in that creation, but whether as primary and only creator or simply as work-for-hire, following detailed instructions from above, is still not clear, nor is it likely to be, it seems. 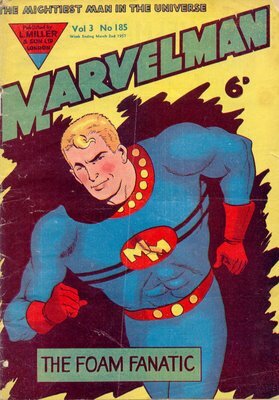 What is clear is that Mick Anglo, through Mick Anglo Ltd and the writers and artists at Gower Street Studios, provided the Millers with Marvelman material for the next six years, until the title went from weekly to monthly, and became a reprint title. Marvelman wasn’t the only superhero title that Anglo created, although most of those that followed were based on his earlier work. There was Captain Universe, AKA The Super Marvel, who was a man called Jim Logan who said the magic word GALAP to be changed into his alternative incarnation, published for one issue in 1954 by Arnold Book Company; Captain Miracle, a man called Johnny Dee with the magic word El Karim, published for nine issues by Anglo Comics starting in 1960, just after Anglo ceased working for the Millers; and Miracle Man, a man called Johnny Chapman with the magic word Sundisc, published for thirteen issues by Top Sellers in 1965. 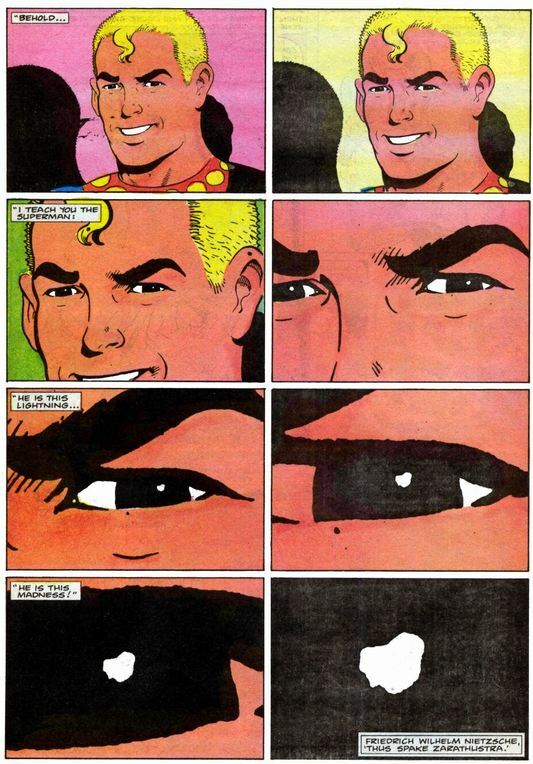 The last two are said to simply be redrawn Marvelman stories, in much the same way that some of the Marvelman stories are said to be redrawn Captain Marvel stories. As the years went on, Anglo continued to work in UK comics, but more at the production end, as an editor and packager, rather than as a writer or artist, and his output, over all the years, is substantial, and significant. 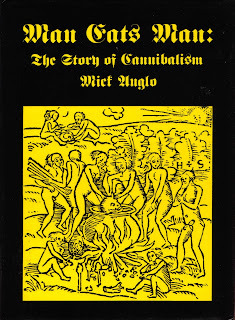 He also wrote several books for Jupiter Books, like Penny Dreadfuls and other Victorian Horrors, and Man Eats Man: The Story of Cannibalism. It was also for Jupiter Books that he wrote a series of books with the series title of ‘Nostalgia – Spotlight on…’, including Nostalgia – Spotlight on the Fifties, which contains an article called The Age of Marvelman, which contains his version of the story of the creation of Marvelman. 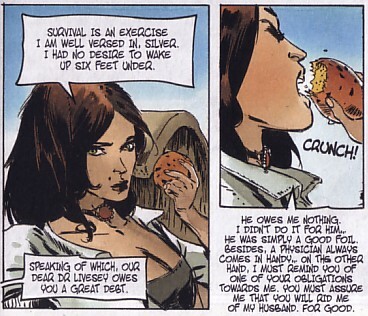 In 2007, Anglo’s Marvelman rights were sold to Emotiv and Company, allegedly for £4000. What exactly those rights are, and where they come from, has also been the matter of much conjecture, but neither Emotiv, not Marvel Comics, who subsequently bought those rights, have publically clarified any of these issues, nor do they appear to intend to do so in the foreseeable future. Much has been said, particularly in the past few days, of Mick Anglo’s place in British comics’ history. For myself, I don’t think he was the huge creative genius that people try to make out he was. He certainly wasn’t the hugely influential, legendary comics’ creator that the American comics media seem to want to make him out to have been. What he was, rather, was a man who worked hard to make a living in tough times, and who ended up providing employment for not only himself, but many others as well. He was not interested in owning any of the rights to the characters he worked on, but simply in doing the work he was asked to do, and getting paid for it. His set up was as a comics packager, producing a finished periodical to specifications from a publisher, and this is what he did. In these more enlightened times, that may not seem like much, but at the time it was good honourable work, which he did to the best of his considerable ability. He worked hard at what he was good at. That seems a good enough for epitaph for any of us. 2000AD is heading north to Leeds for the annual Thought Bubble comic book convention, taking place at the Saviles Hall conference venue at Clarence Dock in Leeds. That's right next to the Royal Armouries museum, on 19th and 20th November, this year’s event taking place over two days for the first time. The editorial team will be there with a cornucopia of comics class and tables piled high with the greatest and the latest titles from more than three decades of Thrill-power, along with a constellation of top comics talent signing and sketching at our dedicated signing table. Lined up are Boo Cook (Elephantmen), Simon Davis (Ampney Crucis), Peter Doherty (Devlin Waugh, Shaolin Cowboy), Al Ewing (Zombo, Judge Dredd), Jock (Detective Comics, The Losers), Colin MacNeil (Judge Dredd, Chopper), Rob Williams (The Iron Age, Cla$$war) and Andy Diggle (Daredevil). For the first time the comic is also holding 2000AD portfolio sessions, but with a Dragon’s Den-style twist! Want to be the next great artist to draw Judge Dredd? Then, as we've mentioned here before, take this opportunity to have your art seen by one of the world’s best know publishers by entering the 2000AD portfolio challenge! Budding artists should view the free sample script on this page: draw their own version of it, and bring their efforts to the portfolio sessions being held at the 2000AD table on the Saturday. The six best efforts chosen by Tharg himself will then go before the searing eyes of the Galaxy’s Greatest Comic at a special 2000AD panel on Sunday at 3.00pm – artistic judges will include Colin MacNeil, Boo Cook, Peter Doherty and more. 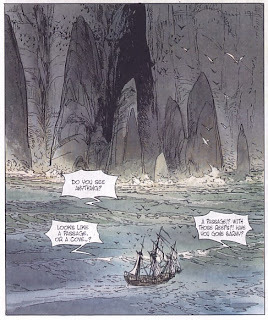 Cinebook have reached the third in writer Xavier Dorison and artist Mathieu Lauffray's Long John Silver series, The Emerald Maze, set some 20 years after the events of Robert Louis Stevenson's Treasure Island. Lady Vivian Hastings' husband has found the fabled treasure city of Guiana-Capac in South America and sent the native Moxtechica to England with a request for her to hire a ship and crew and come to him. Vivian hires John Silver and his pirates so that she can take control of the Neptune from its rightful captain when she needs to and, during an immense storm, Silver has lead a bloody mutiny. In the quiet aftermath of the storm, Silver takes the captaincy of the Neptune and navigates the ship from the ocean, between the sea cliffs and into the rivers of the continent. As the Neptune sails upriver through the rainforest to find the lost city and the Nimrod, Lord Hastings' ship, and its crew, the Neptune's crew have to face the challenges of this new and unknown continent. Quite how a ocean-going sailing ship can sail against the flow of the river when surrounded by towering rainforest trees is not something to dwell on here as the fast moving action of the previous book turns into a relatively relaxed quest through the emerald maze of the rainforest in search of the Nimrod which, considering it is on the front cover, we already know that they will find. Yet despite this the story maintains its grip on the reader as this part of the ongoing story becomes an exercise in characterisation and scheming. 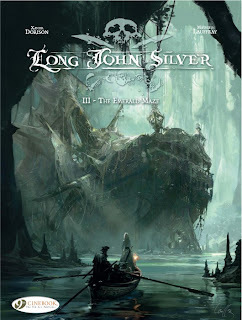 Writer Dorison brings Lady Vivian back to the fore after sidelining her somewhat in the previous book as she reasserts some authority amongst the pirates and impresses even Silver. It is she who boards the hulk of the Nimrod to find her husband's journal that tells of the final days of the ship while the Neptune's crew investigate the buildings on the shore. Artist Lauffray delivers a quite beautiful painted cover while his internal art maintains the quality of the previous two books with striking two page spreads to indicate the vastness of the ocean and, once through the dangerous sea cliffs, the vastness of the interior of the South American continent with its rainforest. Unusually for Cinebook the next album in the continuing Long John Silver series has not yet been published in French. Indeed at the time of writing it is not even listed as a pre-order on Amazon.fr, although Amazon.de gives a German release date of March 2012, and it is therefore not scheduled by Cinebook in the first six months of 2012. That seems a long time to wait for the next book but it is, of course, typical of the gap between the French albums. Long John Silver - The Emerald Maze maintains the quality of the previous two books in the series while setting the scene for the fourth book that, based on this one, will be highly anticipated. • There are more details of the Long John Silver series, along with preview pages of each book, on the Cinebook website. 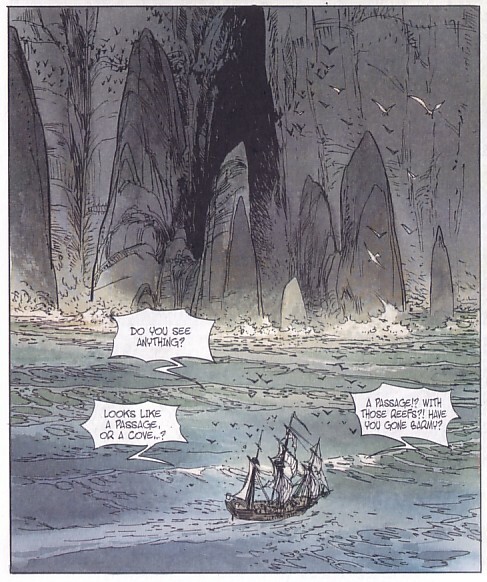 • There are more details of the original French language versions of Long John Silver on the Dargaud website (in French). 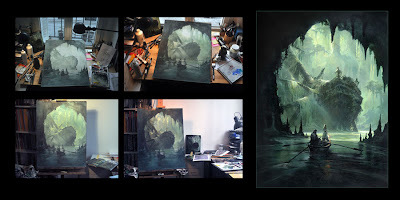 • There are more details of Mathieu Lauffray's artwork on his website and many Long John Silver illustrations on his blog including this step-by-step image of his excellent Emerald Maze cover.